Searching for replacement Oki toner does not have to leave you strapped for cash. Fortunately, here at Cartridge Save, you'll pay less for toner than anywhere else. Not only are we really affordable on the price of Oki C330dn toners, we also place a large emphasis on cartridge quality. You can forget spending expensive high street pricing. We think you should never need to give up on print quality to buy a reasonably priced Oki C330dn printer cartridge. Subsequently, we offer you a guarantee so there isn't any reason to feel disappointed. We'll offer you a 100% refund in the event that your Oki C330dn toner cartridge has not been able to meet your expectations. Place your now on Cartridge Save to save money. Fast, efficient and affordable, the Oki C330dn is the ideal printer for homes and small businesses with low to medium volume projects. The compact and slim-line device offers amazing power and features for its size and cost, including brilliant printing speeds of up to 23 pages per minute in colour and 25 pages per minute in black and white. Reliable as well as professional, the machine promises a robust 45,000 pages per month duty cycle alongside fast warm-up times of as little as 8.5 seconds. The up-to-date HD Colour Printing technology in the Oki C330dn ensures crisp and clear image outputs thanks to multi-level LED printheads and micro-fine toner that creates perfect results on both copy and gloss paper. The stylish, cube-like Oki C330dn is surprisingly low profile, measuring 16.1x 19.8 x 9.5 inches and weighing about 48.5 pounds. It offers versatile paper handling capacity that starts at a standard 350 sheets and can be expanded to a maximum of 880 sheets. The machine also includes a decent duplex double-sided printing feature to reduce user input and increase overall efficiency. The device comes with a speedy PowerPC 532MHz processor and 128MB memory, which can be increased to a maximum of 640MB. It also includes a fast Ethernet port for internet connect as well as USB 2.0 connection ports. 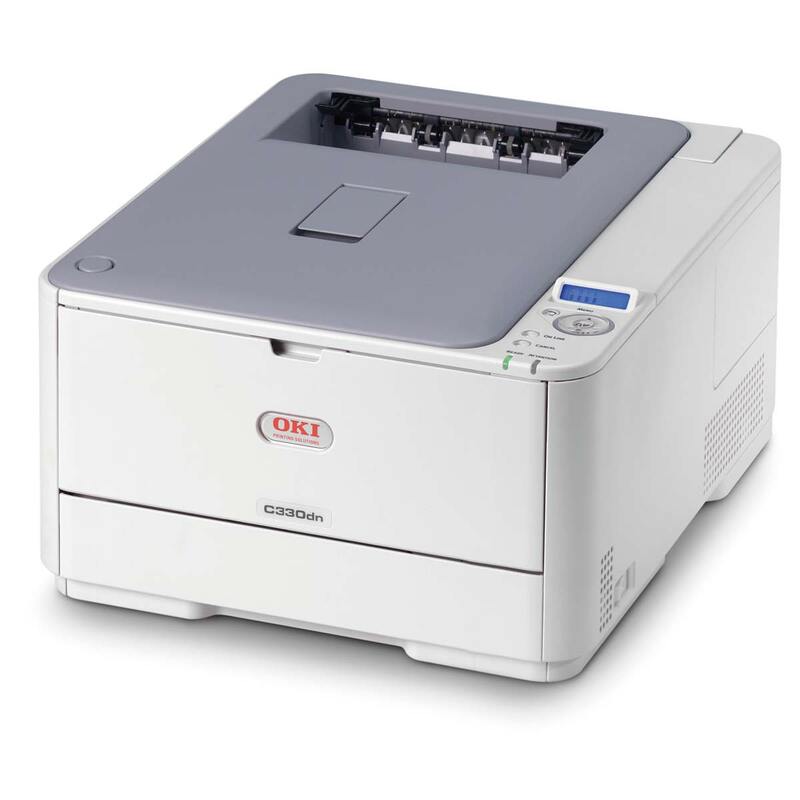 For a small-scale colour and mono printer, the Oki C330dn is extremely fast and reliable. The inclusion of two-sided printing as standard is a great feature and time-saving option for consumers. The standard paper storage capacity as well as optional additional story is very decent for a printer of this size. Due to its speed and processing power, the Oki C330dn does lack in clarity when it comes to some colour text and colour graphic printing.